Russian Revolution (1917) - Russia had routinely lagged behind the rest of Europe in terms of its societal evolution. Peter the Great famously traveled to Western Europe in an attempt to close the technology gap between it and Russia. Likewise, while governments were reforming in Europe after the American Revolution, Russia held fast to it monarchy. For three-hundred years the Romanov dynasty ruled Tsarist Russia, but by the early 20th-century, things were falling apart. In 1905, Russia suffered a humiliating defeat in the Russo-Japanese War; and financial distress among the masses led to its first revolution that same year. After the outbreak of World War I in 1914, life deteriorated even further. Despite the eventual victory of the Allied Powers, Russia was surrounded by its enemies and cut-off from the western nations. As a result, very few goods flowed into the country resulting in severe hardship. The army was running short of munitions and the people were running short of food. In the span of less than three years, Russia virtually collapsed economically and militarily. Tsar Nicholas II (who would be Russia's last) was naturally blamed for the country's existing problems. There were actually two separate revolutions in 1917; the first was in February on the Julian calendar, which was in use in Russia at the time (March on the Gregorian calendar). It lasted only a week, but led to Nicholas' abdication. There were riots in the streets and because of supply shortages in the war, most of the military joined with the protesters. Without the backing of the army, Nicolas had almost no power and was forced to step down. The monarchy was replaced with the Russian Provisional Government led by a legislative body called the Duma. But that was not the end of the revolution. New governments are always fragile and susceptible to overthrow. The Provisional Government kept Russia in the war which remained unpopular at home. Germany looked to keep Russia destabilized by returning Vladimir Lenin, a Bolshevik revolutionary living in Switzerland, to his native country. Its foreign minister arranged to transport Lenin across Germany and back to Russia. He arrived in April and immediately began undermining the Provisional Government. Bolshevik Party membership swelled. The Bolsheviks were socialists determined to establish a socialist/communist government in Russia. But they weren't the only socialists competing for power. 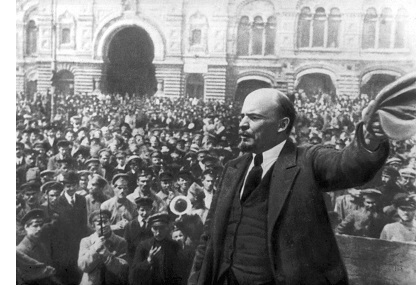 Back in the 1905 revolution, a unified socialist party split into two factions, the Bolsheviks and the Mensheviks. Struggle for control continued between them all the way up to the 1917 revolution (and beyond). The Menshiviks outnumbered the Belsheviks until the return of Lenin. Whatsmore, the Bolsheviks were more organized. Shortly after the February Revolution, they established the Petrograd Soviet, a governing body, which they hoped would replace the Duma. Besides the Bolsheviks, Mensheviks and Provisional Government, there was yet another interested party, the military; or more accurately, General Lavr Kornilov who led the military. Though he had been appointed by Alexander Kerensky, the president of the Provisional Government, Kornilov was no friend of Kerensky's. He hatched a plan to potentially seize power for himself. In August, he launched the Kornilov Affair which was an attempt by the military to destroy the Bolsheviks and its Petrograd Soviet. By doing so, he had hoped to become more popular than Kerensky and force him out of office. The problem was, the attack failed miserably. Kerensky saw the coup attempt coming and formed a temporary alliance with the Bolsheviks. They had built a formidable defense and crushed the attack. In exchange for their help, Kerensky agreed to release several Bolshevik prisoners, including Leon Trotsky, a key Lenin ally. Now the Bolsheviks had just about all the pieces in place. Their power was rising and the Provisional Government's power was in stagnation. 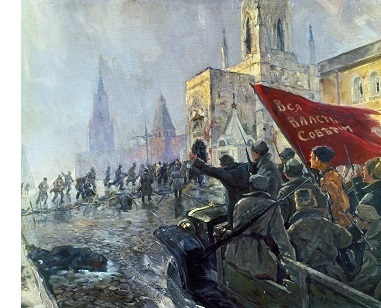 By September, at the Bolsheviks' instigation, workers were striking all across the country. The October Revolution (November on the Gregorian calendar) was relatively quick. The Bolsheviks stormed the Duma and the Provisional Government was powerless to prevent it. The Petrograd Soviet was now the governing body of Russia, the largest country on the planet. The Romanov family was executed to prevent them ever gaining power again. Lenin became the leader, though many historians believe that Trotsky was the driving force behind the Bolsheviks' takeover of power. But they were not in complete control yet. A four-year civil war followed before the Red Army (the name of the Bolsheviks' military) finally prevailed. The country was renamed the Union of Soviet Socialist Republics (USSR) or just Soviet Union. It was the first attempt to run a country based on Marxism. While the Petrograd Soviet was originally an elective body, it was eventually replaced by the Politburo, and open elections were cut-off in favor of appointed positions in order to prevent non-party members from participating. The Soviet Union stood until 1991 when it collapsed economically.